Mario Party: Star Rush let me experience something special that is hard to find these days: I got to watch a friend play their first Mario Party while getting console-throwing enraged. I haven't laughed that hard in a long time, so for that I'm thankful. The problem, however, is that I most likely won't get to experience gamer rage like this again until the next Mario Party releases in the future, almost certainly for the Switch. Alright, I'll cut to the chase: Star Rush is easily the best Mario Party game to come out since Mario Party 8, though that isn't saying much. Nd Cube, the Nintendo-owned developer behind this game, also made the pretty awful car-based Mario Party 9 and 10, the first iteration for 3DS, Island Tour, as well as some other poorly-received games like Animal Crossing: Amiibo Festival. (The studio also made Wii Party U, which I quite liked.) 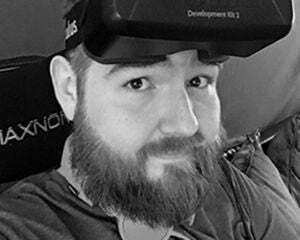 Point being, Nd Cube isn't really known for being a solid developer. 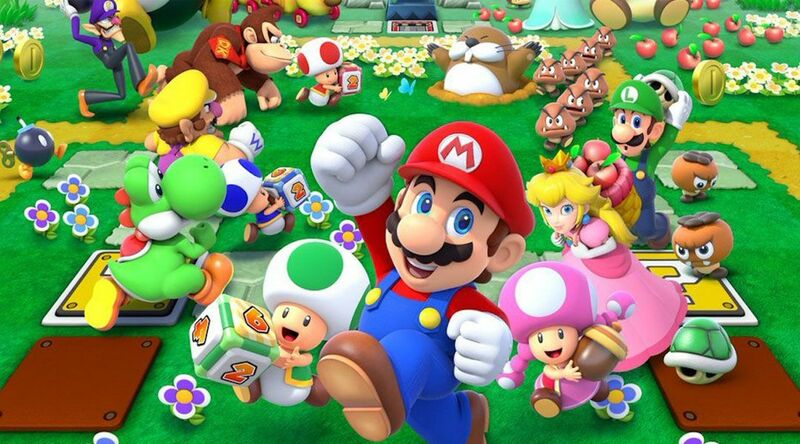 It has made many board game-like titles that didn't always hit the mark, and it royally screwed up the formula of Mario Party, which just happens to be a series that has a special place in my heart as each new iteration was frequently either a Christmas or birthday gift for me as a child. Nd Cube almost had a winning formula this time. Instead of the dull car-based mechanic used in the last two console iterations, or the slow dice-rolling board games of the past, the movement is done in a grind-based system reminiscent of a tactical role-playing game. On paper that might sound stupid, but it honestly works great. Unlike previous games, everyone rolls and moves at the same time, which can lead to a lot of strategic moves. While you may not like these changes if you prefer the more random-feeling past games in the series, personally, I love it. Mini-games happen after nearly every turn, depending on if someone hits a coin or battle balloon. This means you won't just be rolling and moving for a majority of the game while starving for a mini-game like the previous three iterations. Unfortunately, Star Rush manages to have the least amount of mini-games in the series history: 53 in total, 12 of which are only available in the secondary coinathlon mode. 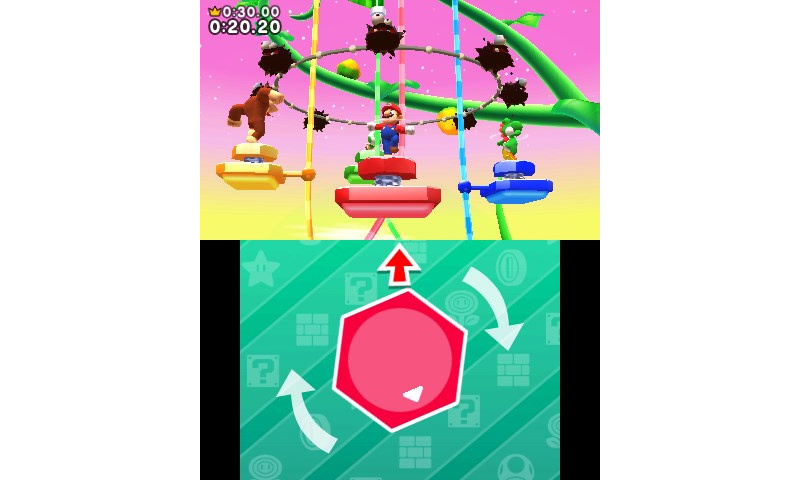 For comparison's sake, most Mario Party games had at least 70 different mini-games, with the previous 3DS game having 81. By the time my friend and I had played two full games we'd already repeated some mini-games multiple times. Most all them are fun aside from maybe two that are completely random with no skill involved whatsoever, but there just isn't enough of them to keep the party going. Instead of a set number of turns, maps have a set number of bosses to defeat before the game is over, meaning you and your friends (or the AI) can dictate just how long games go on for. While boss battles are cool, if not just glorified mini-games, there are so few of them that the repetition kills any excitement aside from the first time playing them. There are 12 total playable characters, many of which need to be unlocked by earning points just for playing the game, or alternatively scanning their amiibo. The usual characters are here joined by the likes of Toadette, Rosalina, and... Diddy Kong? Since when was Diddy Kong invited to these parties? I'm sad to report that Birdo is, unfortunately, missing in action. Surely Nintendo is just building up anticipation for Birdo's very own game, right? 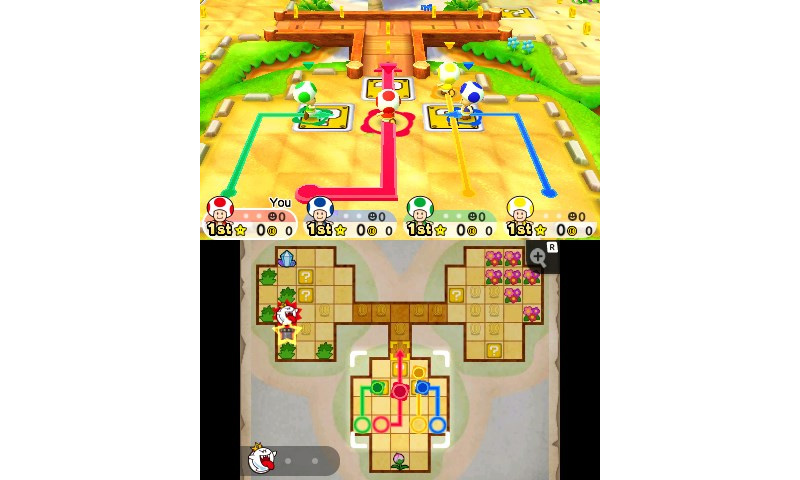 In Toad Scramble, the main game mode, everyone plays as different colored Toads, with other characters spawning randomly on the map that can be collected. 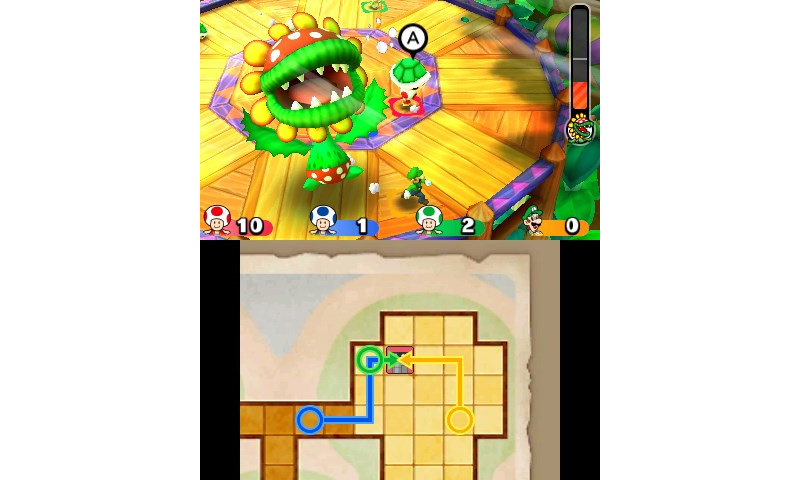 Each character has their own special block that typically is more risk than reward, as well as abilities to snag extra coins from certain spaces on each map. Ally characters also help out in mini-games, meaning they are extremely important to grab if you plan on actually winning. They make a big impact on the gameplay, considering every 10 coins nets you a star at the end. The best thing about everyone playing as Toad is the insane cacophony of high-pitched screams you'll hear. If you've ever wondered what it would sound like in Mushroom Kingdom's Hell, wonder no more. Strangely, the voicework for Donkey Kong is completely different from any other that I've heard and in a bad way. Seriously, I hate it. Other unlockables include some supplementary modes like coinathlon that has players racing laps around boards with spaces moved dictated by the number of coins earned in each mini-game. Balloon Bash is a bit more old-school as you'll be playing a certain number of rounds and earning coins to buy stars, but there are only three small boards available for the mode and it feels much weaker than Toad Scramble. Aside from those there's a rhythm mini-game that is eerily similar to Wii Music (aka Shigeru Miyamoto's shame), a lane-based board game with Chinese Checkers-like rules, a competitive match-three mini-game, and the challenge tower which is essentially just Minesweeper. None of them are worth playing more than once, or even going into much detail about. Like everything else in this game, they could have used just a bit more variety and longevity. While Star Rush isn't the horrible 'car' wreck of the past two titles in the series, it is hardly recommendable due to a lack of mini-games and thus content, even if four players can play nearly the full game pending one other in the same room has the game (there is no online play to speak of, in case you were wondering). It is a shame, honestly. If there were around 30 more mini-games, and more bosses, this would have been easily recommendable, but as it stands at $40, it feels too expensive for what little is here. Now if you'd excuse me, I'm going to go to my Reggie shrine that I have in my closet and perform a blood sacrifice in hopes of getting a remastered collection of the classic games for the Switch. Praise be to his body, as it is always ready!